The city walls of Hattusha, the capital of Hittites, built in the 14th century B.C. Local people are taking part in the ongoing archaeological excavations in the ancient city of Hattusha, which is located in the Boğazkale district of Çorum province. The locals are appreciative of the opportunity even if it is for a short time because they help bring ancient pieces to light and have a chance to earn some money in a region where there are not many job opportunities. 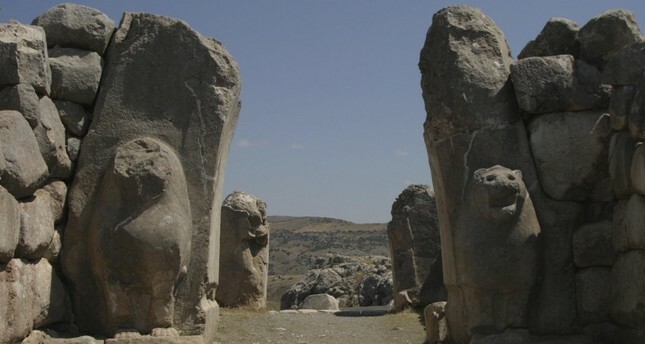 Hattusha was the capital of the Hittite Empire for 450 years; it washosted by the Hattis and the Hittites, two of the first civilizations in Anatolia. It is the only ancient city listed in UNESCO's World Cultural Heritage List and Memory of the World List. It is also one of the most exceptional tourist areas in Turkey. Local people contribute to the excavations in the ancient city of Hattusha. Hattusha is where the Hittites and the Egyptians made the Treaty of Kadesh, which is known to be the first written peace agreement in history signed in 1,280 B.C. This is of significant in terms of bringing historical pieces to light and providing employment for local people. Hattusha is located in Boğazkale, which is one of the smallest districts in Çorum with a population of 1,200 people. While some of the people living in the town earn money by selling souvenirs related to Hattusha, some others work in the excavation site and make a living the "historical" way. Approximately, 105 people from the town go to the excavation site every morning together with Schachner, who is the head of excavation. They work on behalf of the German Archaeological Institute and carry out tasks assigned to them. In addition, workers who help the excavation team during the excavation and restoration works witness thousand-year-old historical pieces brought to light. The clay tablet of the Treaty of Kadesh on display at Istanbul Archaeology Museum. Schachner told an Anadolu Agency (AA) reporter that the excavation works provide a side income for local people and they provided a significant economic contribution to the town. Emphasizing that they work with a group of 50-60 workers every year but they employ 105 workers this year since the funds are higher, Schachner said, "We have more workers this year. We hired more workers thanks to higher budget and we provided employment for 105 people. We make a significant contribution to workers and the town's economy. There are workers who retired from the excavation works and those who took out a policy and paid their premiums through this work. Also, there are those who retired years ago but continue to work here." In addition to stating that there are limited job opportunities in the town, Schachner said, "The excavation site is an income channel since there are not many job opportunities here, unfortunately. That's why the excavation works in Hattusha differ from other excavation works due to its humanitarian aspect. It is important for local people to stay in their hometowns. This has become a tradition and we will maintain it." One of the workers, 60-year-old Bekir Ataman said that he has been working in the excavation site for 10 years to earning side money. "They provide insurance and we can retire. This is a very good opportunity for us. This excavation makes a great economic contribution to Boğazkale," stated Ataman. Another worker, 58-year-old Yasin Özer stressed that he just started working in the excavation site. "I was working on construction sites in Antalya. After meeting Andreas, we came here. I have been working here for three months. Our insurance is being paid. There are not many job opportunities here. The number of people working in public institutions is low. People who are working in husbandry are not many, either. This place is like a smokeless factory. After working for three months, we can buy wood and coal for winter," he said. The 65-year-old Ethem Kölemen, who works in the excavation site with his brother, said that they are happy to be a part of the works. "This is my first year here. I found a bull-shaped drinking cup a short time ago. It is said to be worth millions. It is very exciting. Eight percent of this site has been excavated. There is much more to excavate. It is a smokeless factory for local people. It provides employment for the people living in Boğazkale," he added.